The following post was written by Liz Beres, a NYC-based dancer; dance teacher; and yoga teacher, certified by The Perri Institute for Mind and Body. Liz currently teaches yoga privately and at various gyms, including that of the Federal Reserve Bank of NY through Plus One. She is continually intrigued by and appreciative of the power of mind/body practices, and is grateful for the chance to share her musings on MindBodyBrew’s digital platform. I was born a perfectionist. Or so I think. From a very early age, I was seeking the approval of authoritative figures in my life--my parents, my teachers, my friends’ parents. It’s not to say I couldn’t or wouldn’t think for myself; since so much of my childhood was spent outdoors in the realm of my imagination and those of my brothers and friends, relatively few tangible bounds actually existed in terms of what we could or could not do. But in my mind, boundaries of right and wrong began to build very early on, based on the positive or negative feedback I received from the influential adults in my life--and because I didn’t want to create conflict or pain for them or for me, I attempted to act in ways that mitigated the possibility of struggle. Now, how effective this strategy was certainly could be debated. How conscious I was of its hold over me undoubtedly ebbed and flowed throughout my younger years. Clearly we as humans cannot be perfect; over the course of our lives, we fall innumerable times from our lofty goals of who we want to be and how we want to make that happen. To consider these falls failures maybe seems harsh, but perfectionism divides the world into black and white entities, of right and wrong and good and bad, as determined by that individual and his or her life experience. I’m no academic expert on perfectionism, but as one who is slowly dragging herself out of the throes of perfectionism in a desperate attempt to come to terms with our inherent human imperfection, the contemplation of ‘failure’ has become imperative. My view of the notion of failure has shifted drastically--from seeing it as insurmountable to, now, simply as a chance to persevere. If a stark division of color exists in a perfectionist’s world, what then truly exists in our imperfect world? I would imagine that diversity endures, that the potential for harmony survives alongside the promise of discord. In today’s world, diversity issues are hot topics of discussion--diversity in regards to race, gender, religious beliefs…the list goes on and on. But how often do we speak of the diversity that lives in each and every one of us? Family, friends, and colleagues may be able to define us by certain traits, but if they were to complete such an exercise, would they readily recognize or identify the contradictions that exist in our words and actions and general ways of being in the world? At a younger age, I would have avoided looking at those uglier bits of myself, but recently, in witnessing those rough edges more frequently, I’ve come to an abrupt halt in my desire for denial, and instead, have emerged amidst the conflicts I’m facing with a burning desire to be real. I’ve realized that no matter how hard we try, we inevitably will be ugly and beautiful all at once; we may be able to compartmentalize our disparate pieces in differing settings or moments, but it’s all of these pieces that make us whole at the end of the day. In my more harrowing moments as of late, I’ve yearned to run away. If I’ve had the time to do just that, I’ve done it; ran until my headspace felt cleared of its mess; ran until my heart raced from the sheer force of my body piercing through space, and less so from the banging of my pained heart against its cage. As we travel through life, each of us has different guides--the head, the heart, the gut, or more than likely, an alternating combination of these. When answers are sought, clarity seems necessary, but to discover logic amidst complex challenges becomes nearly impossible. How can we gain some grasp of the situation? 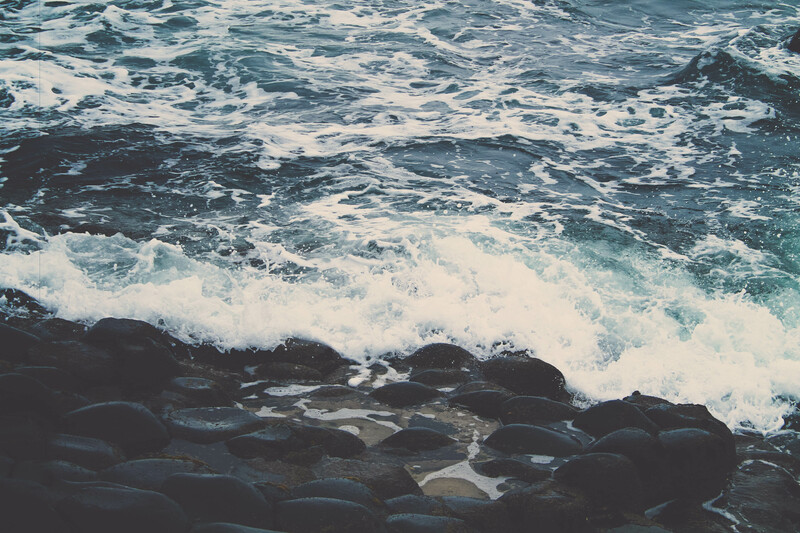 How can we move forward even as we’re being knocked over by waves that continue to crash in? In his Yoga Sutras, Patanjali defined yoga as a cessation of the fluctuations of the mind. I would argue too that if we believe yoga to be capable of aiding us in calming our minds, that we too could enlist this practice in quieting our chaotic hearts. But what does this sutra suggest, then? I love that in searching for the definition of cessation, I came across this: ‘a temporary or complete stopping’. Yoga does not disable our minds or our hearts; it does not cast away our capacity to be chaotic, in thought and feeling and deed. Rather, it offers us a chance to pause, to stop for a moment or more, to decipher where it is we are. It is in that suspended place--between what has been and what could be--that we can gather all the distinct bits of ourselves and endeavor to move forward with the whole of our being in mind. In sitting at the bottom of a sea of swirling thoughts, emotions, and events, we probably will feel the pressure of the water engulfing us--and we may still fear and be in danger of being tipped over by a rush of emotion or circumstance. But if we can reach a moment of stillness, could we rediscover our roots from which we want to grow, from which we hope to grow and will try to grow? And you really will have to make it through that violent, metaphysical, symbolic storm. No matter how metaphysical or symbolic it might be, make no mistake about it: it will cut through flesh like a thousand razor blades. People will bleed there, and you will bleed too. Hot, red blood. You'll catch that blood in your hands, your own blood and the blood of others. I am reminded that because these storms brew within us, we must take responsibility for them and face them head on. And we must comprehend and accept that imperfect conditions especially shove us into change. We may feel empowered, or we may feel defeated. But to lose control of our ideal presents us with an opportunity to discover a new way, a middle path through the chaos, through the fluctuations. We must give over our hope for safety in an effort to move forward, through the joy that lives next door to the pain. The murky road could lead to even foggier fields. The storm will catch up to us if we run. If we can discover our yoga--whether that’s time on the mat or the cushion, or going for a run, or moving through the rooms of a museum--we hopefully can grant ourselves a moment of pause to collect ourselves as best we can, make a decision, and move forward from there. My fallibility has paraded its beautifully ugly head so many times over the course of the last few months. But in showing up so often, it’s becoming less scary and more empowering, for it is serving as a reminder that while we may ‘fail’, while we may not win over every situation we meet, we can try again. Our opportunities to put in effort will never cease to exist. The opportunities may transform, but unless we restrain ourselves, we always can stand up to face the moment. I no longer believe in perfection. But I do hold out hope that from hideous imperfection can come vast amounts of beauty, and growth that we’d never imagined we’d meet.